In Honkai Impact 3rd, life isn’t all about fighting. Your valkyries don’t exist just to clash blades with the enemy, waiting every waking hour for the chance to test their mettle on the battlefield. 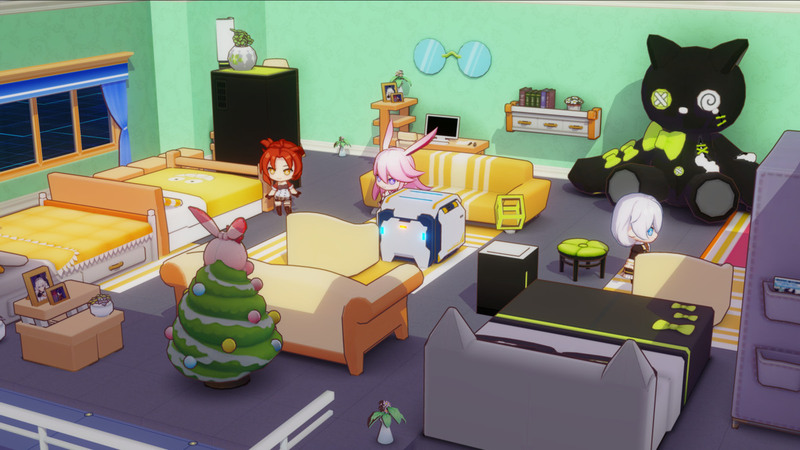 It’s a tiring life fighting against the Honkai, so the girls and their commander need to take a break once in a while. That’s where the chibi dorm expansion comes in, a mix between The Sims and Animal Crossing, except for hardened battle maidens and their weapons. Situated in the idyllic grounds of St. Freya’s High School for valkyries-in-training, the dormitory is where you can get away from the heat of battle and take stock of things. A place to relax and unwind, or prepare for the long road ahead to SSS-rank. The dorm is an expandable living space for cute, chibi versions of your valkyries (and Stigmata) to move into. You can decorate the walls and floors of your dormitory, as well as furnishing it with fittings to make your home as comfortable as possible. A comfortable dorm means happier girls, so crafting furniture for them to relax on is essential. Like all new homes, when you first move into the dorm you’ll be living out of boxes. Sadly, it’s a little more literal in the girls’ case, as all your starting furniture is made out of cardboard – but they’re way too cute to let them live this way! It doesn’t take long to get them sleeping in a nice soft bed, but there’s some work to be done before you’re all relaxing on a sofa in front of a TV. Each valkyrie and Stigmata has a number of “move-in missions”, simple requests specific to them and their activities outside the dorm. 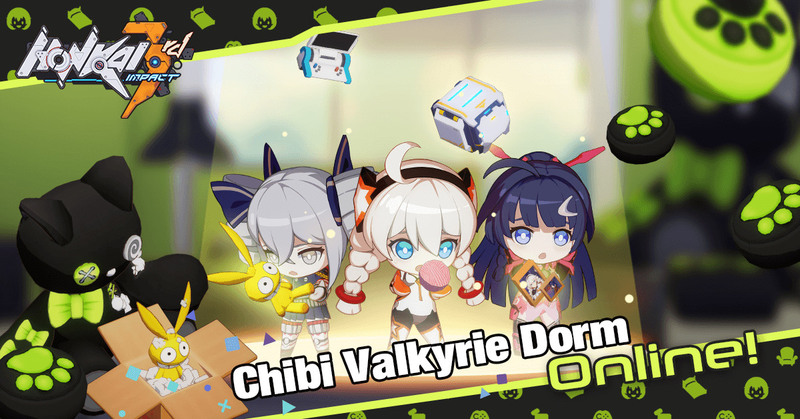 Once you unlock a new valkyrie, their quest to move into the dorm begins and they earn points towards their eventual moving day for completing each one. Some happen through normal play, like reaching level 40, while others will mean you need to play with the valkyrie in certain side missions like the adventure open world or multiplayer raids. Once you complete a move-in mission, you’ll be awarded progress in getting your chibi friend one step closer to chilling out with their friends, and a sum of cash money to spend on decorations and furniture. A hard day’s play out in the battle against the Honkai leads nicely into an evening of relaxing, rearranging your dorm and walking around in your valkyries’ boots while they read and chat with each other. The dorm isn’t all fun and games for these cuties, there’s hard training to be done here too – it is a school, after all! In the common area of the dorm, there are facilities for the girls to use as they train their way up to be top of the class. A treadmill passively earns EXP for one valkyrie if you leave her running for a few hours, while the technique training machine (looks like a DDR machine to us!) will reward another valkyrie with some skill points to spend on new abilities. There are also refinement pods which will level up your weapons and Stigmata without having to use precious resources. And of course, no dorm is complete without a vending machine, which will store up excess stamina earned while you’re at full capacity and allow you to take some out once you’ve tapped your reserves dry. A truly restful place to recharge for everyone involved.